Sunshine Coast. Blessed with 25 kilometres (more than 15 miles) of sun-swept beaches and sitting on the Maroochy River, it was perfect. We left home on a sunny and very warm Saturday morning and turned north along the Pacific Highway. There was hardly any traffic and we certainly made good time as we headed for an overnight rest stop in the Woodburn area in northern New South Wales. Our first choice turned out to be more than just a rest stop. New Italy Rest Area is quite a commercial stop with a café and an Aboriginal museum. It wasn’t quite to our taste so we continued on to the next one only to miss it entirely as it is on the other side of the road and there are no signs as you approach. Oh well, there was nothing for it but to continue on to our third and final choice just past the town of Wardell. Well, talk about impressed! There was plenty of room, easy parking, picnic tables, and very clean, odour-free amenities. Not bad for a roadside rest stop. It was right beside the highway but I, for one, don’t care for secluded when you’re a long way from anywhere! We had a good night, in spite of the constant traffic noise, and set off in high spirits the next morning. It wasn’t long before we passed Brisbane and crossed over the magnificent Gateway Bridge. Now, I’m a Sydney girl and Sydney Harbour is the most beautiful harbour in the world but Brisbane’s Gateway Bridge leaves the Sydney Harbour Bridge looking like a relic consigned to the past – or a poor relation, at least! 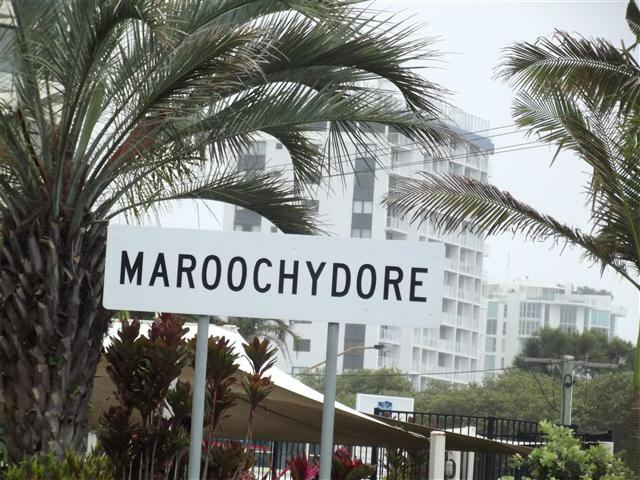 Our accommodation in Maroochydore was at the Alex Beach Tourist Park ([star][star][star][star]) at Alexandra Headland and we arrived in the early afternoon. The park is big and comfortable and has a very inviting-looking swimming pool. The day was hot and very humid and it was very hard to resist that pool! After camp was set up we wandered off into the town to have a look around and for John to check out the best fishing spots. I made sure there was a chicken shop close by. And then we headed back to the park and settled in with our bottle of Two Tails Sparkling Wine to celebrate our first night in a new caravan/tourist park. Later that night we were woken by a huge thunderclap, some brilliant flashes of lightning, and one torrential downpour. Unfortunately it didn’t cool things down much and it was still hot and humid the next morning. The day started out fine and sunny but by 8 o’clock the clouds had rolled in, the wind came up, and the rain came down! 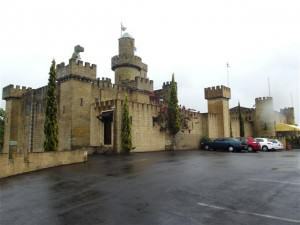 It certainly put the mockers on our plans to visit Australia Zoo but the best laid plans sometimes need a little re-arranging and so we piled into the car and set off for the Sunshine Castle at Bli Bli. after driving all the way down there, we discovered that it was closed for renovations. The centrepiece of the Sunshine Plantation, the Big Pineapple had been on our list of must-sees since our first visit there back in 2003. Never mind, there is a lot more to see and do on the Sunshine Coast and our next stop was at the Ginger Factory at Yandina. 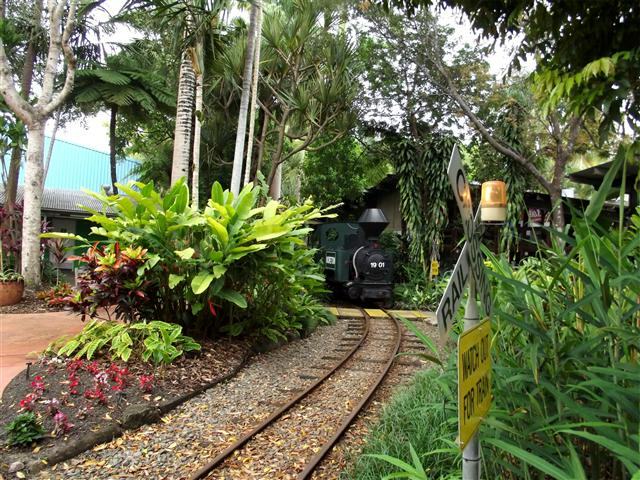 The home of Buderim Ginger is the largest ginger factory in the world and is a very impressive tourist attraction as well. From the café where we had one of the best cups of coffee we’d ever tasted, to the 110-year-old Ginger Train that takes visitors on rides throughout the complex, including the outstanding gardens, to the cruise called “Overboard”, Panny’s Chocolate Factory, and Superbee Honey Production, the Ginger Factory is fantastic. We wandered around the various displays and exhibitions for a couple of hours but when John found his way into the chocolate factory it looked like we could be there a whole lot longer! Especially when he found out about the free samples! demonstrations on at that time but we did learn a little about the history of this unique Australian nut (no, not the one I’m married to!) The indigenous tribes of Australia’s east coast would gather the seeds of the ‘Kindal Kindal’ rainforest tree. These trees were discovered by two European botanists in 1853 and they gave the trees and the nuts their name. The day was dragging on and we wanted to get to Noosa Heads for lunch so we said goodbye to Yandina, the ginger and the nuts and set off for the unofficial capital of the Sunshine Coast. There is nowhere else in Australia quite like Noosa Heads. It has everything from pristine beaches, tropical rainforests, a stunning hinterland, rivers and lakes, and is home to Queensland’s chic-est mall. The town has certainly changed since our last visit here in 1981. There used to be a house made entirely of empty beer bottles and somewhere I have a photograph of the kids standing in front of it. The house no longer exists but we learned that it was only in the last 5 years that it was demolished. If they ever want to build it again I don’t think there will be any shortage of volunteers to empty the bottles! from small cafés and bakeries to 5-star restaurants in Noosa Heads and every one of them inviting. Finally we settled on a bakery where we enjoyed a light lunch before going for a walk to the beach and then up into the national park. 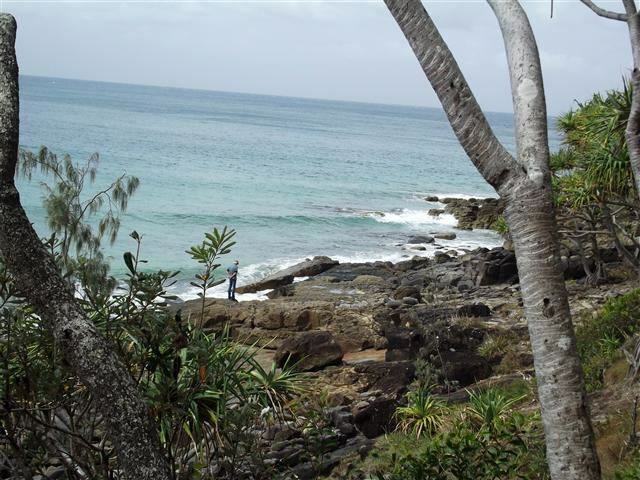 The Noosa Heads National Park is only a 15-minute walk from Hastings Street, and like all national parks, is stunning. The coastal walkway winds through some spectacular rainforest and the views are outstanding. We followed the walkway for some distance before heading back to the car. We would have been happy to walk further but the odd shower of rain didn’t make for a pleasant stroll. The strong southerly wind was making conditions very unpleasant and so we decided to make our way back down the coast to Maroochydore. service in Vietnam in 1969 and in 1971, and in Kuwait in 1991. The wreck is now an impressive artificial reef and a terrific dive site. Not that diving is my thing, I might add; I need a boat hull or at least very thick glass between me and the sharks that live in the ocean! The next day dawned with persistent showers and strong gusts of wind but the forecast said ‘clearing conditions’ so we took a chance and set off for the town of Beerwah and a visit to Australia Zoo. By the time we arrived the weather had cleared and the temperature had begun a rapid upward climb. Now this was Queensland! And what a brilliant place the zoo is! The brain-child of the late Steve Irwin, it’s a wonderful tribute to him and a credit to his widow, Terri, who has continued his work since his untimely death in 2006. 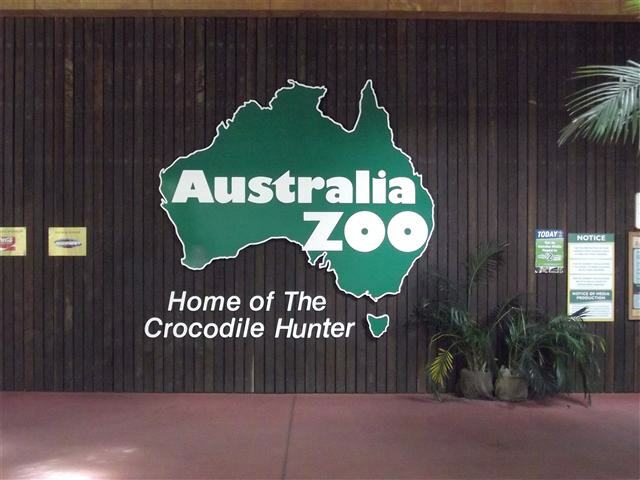 Established in 1970 by the Irwin family and known then as the Beerwah Reptile Park, Australia Zoo was born in 1992 when Steve and Terri Irwin took over as managers. Its original 4 acres (1.62 hectares) has expanded to over 70 acres (over 28 hectares) and is Australia’s number one tourist attraction (Australian Tourism Awards 2008). We arrived at a little after 10:00 and, along with hordes of children on school field trips, made our way into the zoo. The rainforest-like design features animals in enclosures that closely resemble their natural habitat. From the rhinoceros iguanas at the front entrance through to kangaroos, koalas, Tasmanian devils, and, of course, crocodiles, the whole zoo is simply amazing. 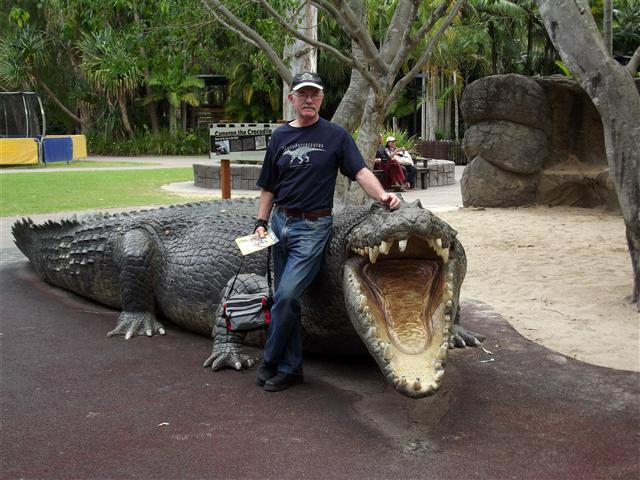 At the Crocoseum we were treated to a display from native birds, learned what not to do with a snake (I always thought running the other way was a good idea), and how not to get eaten by a saltwater crocodile. 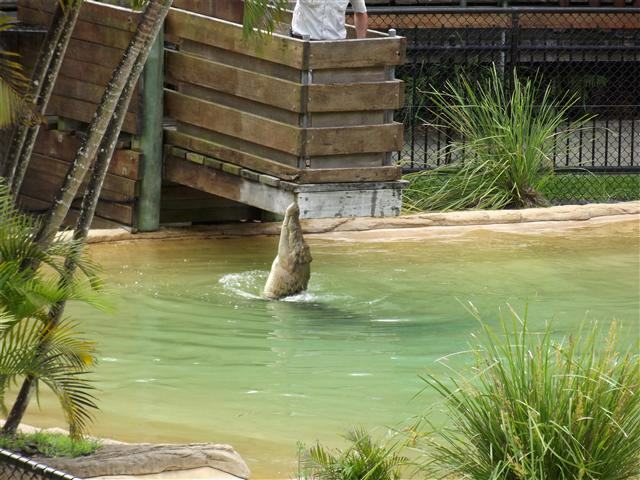 We moved on after the show to the dingoes and saw some baby Tasmanian devils (so cute but not really house-trained), and then visited the crocodile pens where we watched a very brave man feeding saltwater crocs (one false move and he could have been dinner! ), saw freshwater crocodiles and even American alligators. cave. Personally I could have done without that, we see enough of those things where we live. But then I wanted one more look at the crocodiles before we left. They truly are the last of the dinosaurs and have been around for about 240 million years. The next morning we visited the HMAS Brisbane memorial. 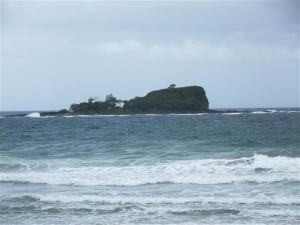 The mast from the ship is located on the bluff of Alexandra Headland, a short distance from Maroochydore. It was dedicated in August 2006. The views from the Headland are stunning and we enjoyed a walk around the park. the Keystone Cops! Not quite Sydney-Hobart material! The next day was one of those days that Queenslanders brag about. Not a cloud in the sky and the temperature climbing rapidly. 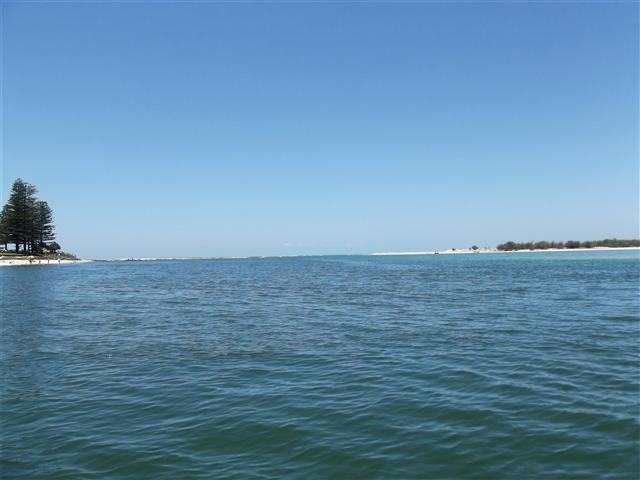 The waterways of the Sunshine Coast are spectacular and we set off from Pelican Waters near Caloundra for a morning cruise out to Bribie Island aboard the Caloundra Cruises vessel Riverlight III. Bribie Island is one of 3 major sand islands that hug the Queensland coastline. It is 34 kilometres (21 miles) long and 8 kilometres (5 miles) wide at its widest point. Most of the island is national park but there are some residential properties at the southern end. The day was absolutely sparkling as we cruised out through Pumicestone Passage. The Passage was discovered and named in 1799 by Matthew Flinders when, during a brief exploration of the area, he found rocks resembling pumice. We cruised past Bribie Island National Park and skirted Tripcony Bight Conservation Zone, a part of the Moreton Bay Marine Park, before moving on to Caloundra Heads. Caloundra is the southern-most point of the Sunshine Coast and there is an inactive lighthouse at the heads. On our way back to Pelican Waters we had views to the Glasshouse Mountains in the distance. The 12 mountains are the cores of extinct volcanoes that formed approximately 27 million years ago. They were discovered and named in 1770 by Captain James Cook, their conical tops reminding him of the glass furnaces in England. 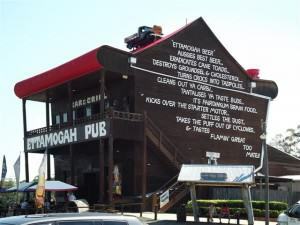 When we arrived back from our cruise it was lunch time and one place I definitely wanted to visit was the Ettamogah Pub. Now, I know that there are Ettamogah’s (or should that be Ettamogi?) all over Australia but we had never been into one. It was a situation I intended to rectify. The Ettamogah Pub originally appeared in a cartoon published in the Australasian Post from 1960 to 1998 and the first real pub was built in Albury in 1987. This particular one was built in 1989 and is the largest of the many Ettamogah’s around Australia. Ettamogah is an Aboriginal word meaning ‘place of good drink’. John was fascinated with the truck parked on the roof and legend says that this 1927 Chevy from a property in Roma in south-western Queensland, was washed up there in the flood of 1991 and no one could be bothered to drive it down! Right. Our lunch was great, even if there was enough to feed a family of four for a week, and we had fun reading all the cartoons around the walls but John was a little disappointed that they had sold out of Ettamogah Beer. The Ettamogah Pub is so Aussie; its style, the furniture, the people, and, especially, the humour. It really is Australiana at its best! After such a huge lunch we really needed a walk but the sun was fierce and I was already starting to burn. 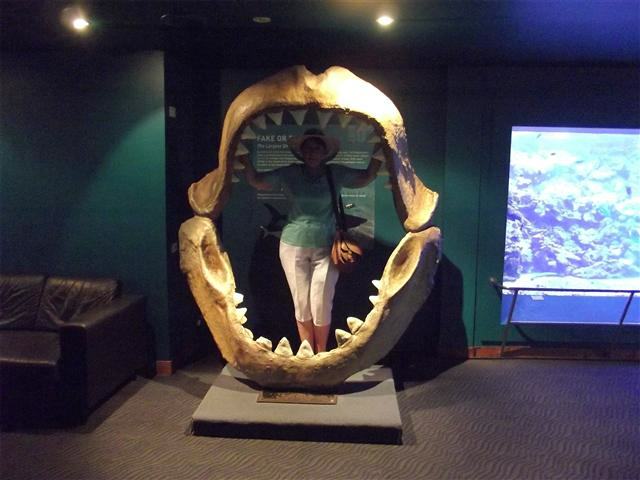 So what better place could there be to have a walk and yet stay indoors than Underwater World at Mooloolaba. All I can say about it is ‘fantastic’! The exhibits were stunning, from the ‘Weird and Wonderful’ where I stood inside a replica jawbone from a prehistoric shark, the Megalodon, the largest shark ever found that lived around 25 million years ago, to the ‘Fresh and Freaky’ that included the nasties of our river systems, even a freshwater crocodile. There was ‘Billabongs and Backyards’, ‘Crawly Creatures’, and ‘Otter Empire’ but my favourite was ‘Sharks Alive’. There is a moving walkway through the aquarium tunnel but also a pathway to walk on. There were sharks, stingrays, and all manner of marine creatures swimming around and over us as we walked through the tunnels. We learned that there are 9 different types of sharks here including the great white and the infamous bull shark. There was a hammerhead shark in a separate bubble-like tank; he was a new addition and still too aggressive to be put in with the others yet. The divers were saying that the only one that causes them any concern is the bull shark; it’s nasty and extremely aggressive, and that’s on a good day! Like a great white on steroids! 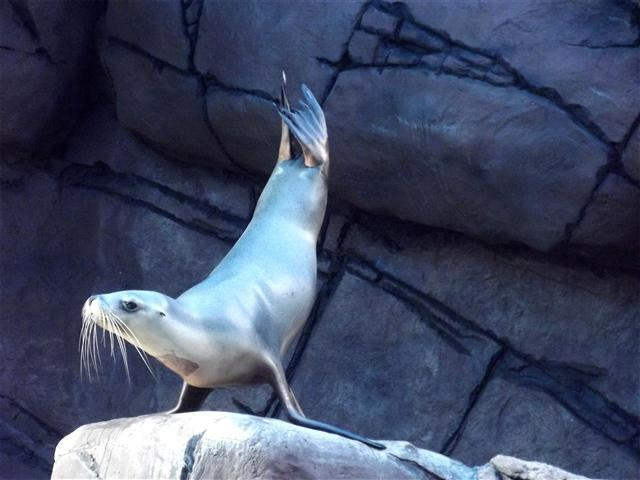 We finished off our visit to Underwater World with a stop at ‘Seal Island’ for the show. The two seals had us in stitches with their antics but the poor “volunteer” from the audience ended up being pushed into the water with them. I think -hope – it was all part of the show. By now it was quite late and we were almost the last people out the door. It was time to go back to camp after what had been a very long but truly fantastic day. And so, in my exhausted state, I was only too happy to agree that it was time John went fishing. We came all the way to the Sunshine Coast and he hadn’t even so much as taken the fishing rods out. It became very windy during the night and a few drops of rain fell in the wee hours; it didn’t look good for the fishing expedition. But the weather cleared to a fine, hot day although it was a pity that the wind didn’t go away as well. Still, we set off for Cotton Tree after breakfast hoping that conditions would get better. 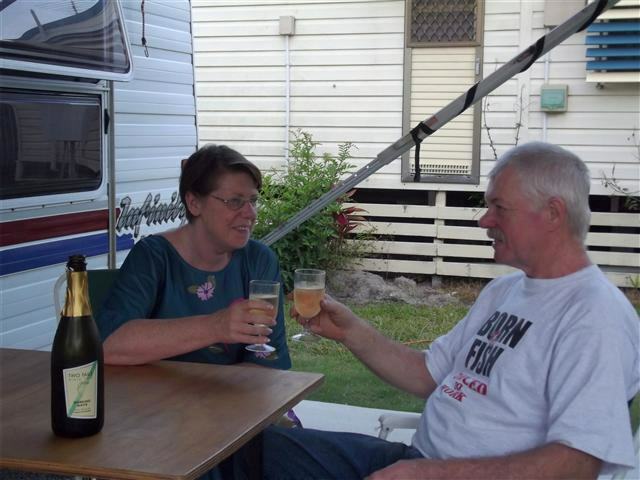 We settled in under the shade of a big old tree on the banks of the Maroochy River and John cast his line. But the wind was playing havoc with everything and he couldn’t get so much as a nibble. About the only thing he caught that day was a dose of sunburn but he persevered, determined to catch something, anything, on this beautiful Sunshine Coast. He finally gave up late in the afternoon and decided that we should go back to camp. Poor John, he looked so disappointed that I didn’t have the heart to make any comments although I’m sure he expected them. So we’d now come to our last day. We had nothing in particular planned for this day but I did mention that a person can’t come to the Sunshine Coast and NOT go to the beach. Quite simply, it’s just not done! We walked down to Alex Beach this morning and took ourselves for a stroll along the sand. The water was warm and the sand was very easy to walk on. I have always hated trying to walk in soft sand but this was great. 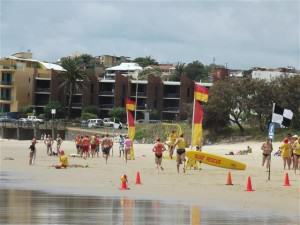 We passed the Alex Beach Surf Club and the lifeguard tower and sat for a while to watch the surf carnival. 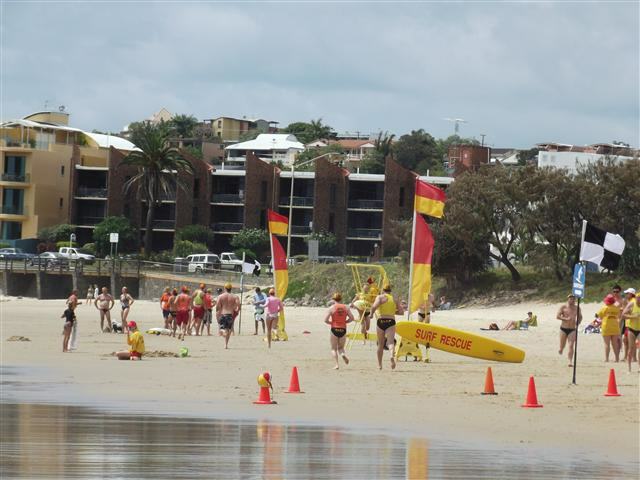 There were a lot of people on the beach, walking or just sunbathing, children building monster sand castles, and swimmers and surfers in the water but the surf carnival held our attention for a while. The competitors, bronzed Aussies one and all, hardly looked like they were raising a sweat. After a while we returned to the access path and then continued on in the other direction. The beaches here are fantastic. There are literally kilometres of white sand and the water is such a deep shade of blue, it’s absolutely stunning. We left the beach and started waling back to camp but the day was hot and humid and the tourist park’s pool looked very inviting. Swimming is another “must-do” for the Sunshine Coast and we made excellent use of the pool and park’s facilities. It really was the perfect end to our holiday. That evening we walked over to Cotton Tree for dinner at the Bullockies Steak and Seafood Restaurant. Subtle lighting and a pleasant atmosphere greeted us as soon as we walked in the door. The whole place was great. From the staff, who were friendly and helpful, to the terrific food, and live entertainment that wasn’t bad, we had a great night. The Sunshine Coast is one place that we will certainly come back to sometime. We haven’t been even remotely disappointed by any part of our time here, even the lack of fish didn’t really put a dampener on our stay. Well, they could have had some Ettamogah Beer!